KUALA LUMPUR, Malaysia, 01 February 2019 – Engineers Anthony Hall and Rob Sharples have just pushed the Ranger Raptor to its limits on a private test track. Responsible for integrating the new powertrain – a Bi-Turbo diesel engine and 10-Speed transmission – across the Ranger and Everest line-up, the teammates look suitably happy. Hall is right: the high-speed off-roader has created a new class of vehicle destined to spawn a legion of imitators. While much of this capability comes from Raptor’s revolutionary chassis and suspension, it was clear that the remarkable new powertrain at Raptor’s heart had to be made available across the Ranger and Everest line-up. 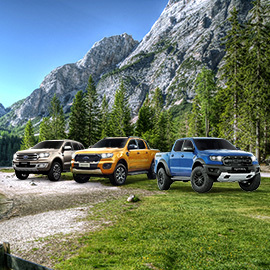 Both the diesel engine and 10-speed transmission are highly proven: the transmission is in iconic vehicles such as the F-150 Raptor and Mustang, with over half a million kilometres of extreme and real-world testing behind it. Together, with the UK developed Bi-Turbo engine that has gone through torturous thermo-cycle testing, the pairing of the two brings spectacular results to the nimble bodied Ranger platform. Ford’s Chief Powertrain Engineer, Rob Sharples, says the integration of the engine and transmission with sophisticated electronics and drive systems has delivered a powertrain as at home racing across the desert as it is cruising suburban traffic or towing a trailer. Anthony Hall agrees. While he is happy to roll out some of the impressive numbers, the new powertrain has delivered in its different personalities, a maximum 157KW of power and 500Nm of torque, a class leading 3.5 tonnes towing in Ranger and Everest, 6.9 litres/100km combined fuel economy in Everest, astonishing 850mm water wading in Raptor, he believes it is something that needs to be driven to be truly appreciated.